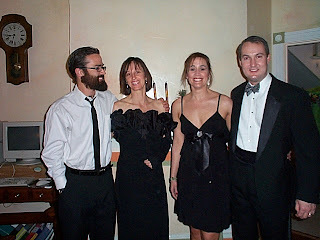 We went to Fancy Dress-- a super fancy dance that my husband's work puts on for them. It was super fun and we danced the night away. We almost made it to when they had a 1am breakfast, but Cinderella's 4" heels were not working for her. The funniest part is-- we lost our ride home and had to walk. Luckily, we live somewhat close, but as I said, my feet were done with shoes at that point, so I walked home barefoot with my hubbie carrying me over the rough spots!